It's time for another giveaway hop. 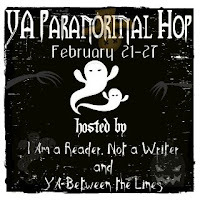 This time it's the Young Adult Paranormal Giveaway Hop which is co - hosted by I Am A Reader, Not A Writer and YA Between the Lines. There are over 150 blogs offering something great to read. This giveaway runs through midnight on February 27th. Want to know what we're offering at Reader Girls? We are offering one e-book copy of Recalled and our giveaway is open internationally. Love or Death? A simple question really. The choice seems obvious. But. What if you never knew love, what if your life was spent just trying to survive? What if you knew your fate before you were fully grown? And you were given another chance. A better chance. This new life depended upon one thing: your job. And so you agreed. You thought it would be simple. You thought it would be cut and dry. And now you are left holding the fate of someone else in the palm of your hand and you have to make the ultimate choice. Find the complete hop list here. I wouldn't mind it. Alot of people seem to come to me for advice (I'm older), so I guess I'm doing something right. Maybe I could pass that along. Tough question. I think once I was gone, I'd prefer to stay gone. This book sounds so interesting. I don't think I'd like to be recalled, though. I think ti would be more trouble than its worth. Sure. I'd want to be recalled. Yeah! A second chance... that sounds great. Yes I would want to be. I dont think i would.. thanks for the giveaway!! Part of me wants to say yes , second chance would be great but there is always a catch and that is what would make me say no. thanks for the giveaway, been wanting to read this book. Regardless if I win, I will eventually get it I think. Might as well. It's better than dead! I would definitely like to be recalled. The prospect of death just doesn't sound very appealing to me and having another chance at life and love would be much better than spending at eternity dead. I'm not sure... I really don't know. Thanks for the great giveaway! I'm not sure, that would be a difficult choice. Thanks for the great giveaway! Thanks everyone! Loved reading all of your responses. I don't think i'd want to be recalled, there's always fine print in those kinda situations. Probably not. I wouldn't want to be responsible for someone else's life or death. Thanks for joining the hop! Nope. It takes enough work just to get one life right. Hm.. thats a toughy cause would you still be you if you were recalled? So probably not. Don't know. Part of my said yes, but the other said no. Tough! No! I love my life, just the way it is! I would definitely like to be recalled. I don't think I would. Thanks!